The corrugator supercilii muscle is a strong muscle that extends from bone near the top of the nose to the underside of the skin just above the mid portion of the eyebrow (glabella). Contraction of the corrugator causes vertical wrinkles between the eyebrows, often called "frown lines." Patients who want to remove the frown lines between their eyebrows have two options: neuromodulators or surgery. Neuromodulators are injectables such as Botox, Dysport, or Xeomin. They temporarily weaken the muscle. Results last about three months for the average patient. 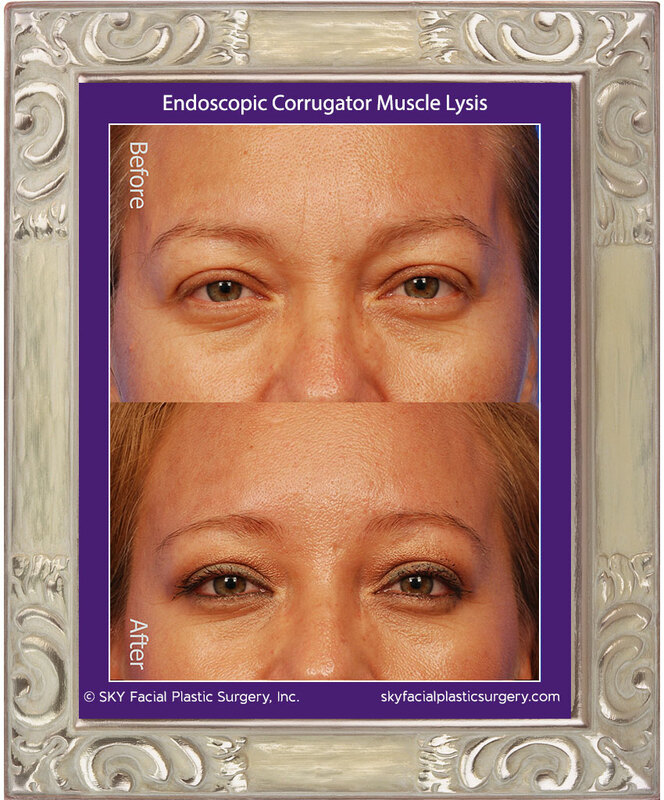 A more permanent solution is to surgically "disrupt" (cut and resect) the corrugator muscle. The surgical approach can either be done endoscopically (no scar) or as part of a conventional forehead lift or brow lift procedure. The endoscopic approach involves two small 1.5 cm incisions behind the hairline (no hair loss occurs).